What's up, Card fighters? You may not remember me, but many name is Chad. I wrote an article for the contest a month or so ago. Today I wanted to discuss a new deck I picked up fairly recently, the Great Nature clan. Now as many people know (or don't know), there are a few different variants such as The Guardian of Truth, Lox variant which focuses on the ride chain. Also, there is the Leo-Pald variant which focuses on getting out School Hunter, Leo-Pald as fast as possible and using his skill and limit break. So without further adieu, let's begin with the variant that I'm currently using, the Lox build. Here's what a standard build should look like. As you can see, the deck seems fairly standard, however, I feel that draw is better for this variant so that you can get to your combo pieces better such as your ride chains and perfect guards. Also, I'm running a single copy of Leo-Pald and three copies of Binoculus tiger in this build even though they work somewhat better in their own build, because they still work really well with this variant and still have a lot of synergy with it. Basically the main idea is to power up your units through different skills, mainly through Gaurdian of Truth, Lox, and Leo-Pald's skills work really well here as well. As you ride each lox, they gain a power boost as long as you have the previous grade in the soul. Magnet Crocodile's skill works very well with both variants because it gains 2000 power for having a Great Nature Vanguard, which this skill works well with Leo-Pald's and Guardian of Truth, Lox's skills becase they both give power and sometimes an extra critical. Before I move on, I would like to explain to you readers how the Gaurdian of Truth, Lox works. Skills: CONT【V】: If you have a card named "Law Official, Lox" in your soul, this unit gets Power +1000. As I already explained, the first skill allows him to gain 1,000 power if you have the grade 2 in the soul. His second skill is a persona blast, hopefully you remember what that is from my last article, and this persona blast allows you to discard another copy of himself to give a rearguard an extra 4000 power and a critical. Hey remember our friend magnet Crocoddile, he's Lox's best friend. The unit retires in the end phase. Next up we look at the Leo-Pald variant is probably quite a bit more expensive and extensive than this variant because there is a lot of versatility in that variant. Before we get to the explanation, let's take a quick look at School Hunter, Leo-Pald. AUTO](VC) Limit Break 4 (This ability is active if you have four or more damage):[Counter Blast (1)] During your end phase, when one of your «Great Nature» rear-guards is put into the drop zone, you may pay the cost. If you do, call that card to an open (RC). 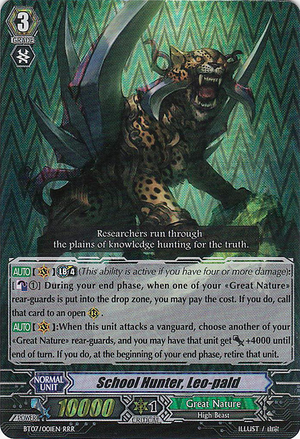 [AUTO](VC):When this unit attacks a vanguard, choose another of your «Great Nature» rear-guards, and you may have that unit get [Power]+4000 until end of turn. If you do, at the beginning of your end phase, retire that unit. So far, Leo-Pald is one of the only grade 3's with limit break that I know of that cme out in booster pack 7. anyway, now to explain his skills. Fact check: Magnet Crocodile gets +2k for ATTACKING a vanguard, not for having a Great Nature Vanguard. Secondly, where the heck are your Hammsukes? Your only targets in both builds are Stamp Sea Otter, otherwise you minus yourself a card when it retires. And if you’re giving the boost to Stamp Sea Otter with Lox, then the critical is wasted. As is, the Leo-Pald build you have listed is totally superior to Lox because he gives a +4k every turn without you losing a card for the persona blast. You cannot give a build and say “here is what a standard build should look like”. Every person builds the same deck a little differently and there’s no way to say which is best. Apart from minor different personal choices, ALL Lox decks are going to be similar. They should have the exact same grade 0s, they should ALL run the G1 Lox, Silver Wolf, and Cable Sheep, they should ALL have the G2 Lox, and they should ALL have the G3 Lox. That leaves 3 slots in the G1 lineup, 6-7 slots in the G2 lineup, and 3-4 slots in the G3 lineup. Those are the areas that are going to differentiate from your build anyways, so why on earth say yours is standard? If you’re going to present a standard, your decklist should only include those obvious cards and leave the other slots as blank “3 G1s of your choice, probably, Stamp Sea Otter or Hammsuke” etc. Why did you say “Leo-pald is one of the only grade 3s with Limit Break in set 7”? There were SIX units with Limit Break in that set. And “so far”? Are more units going to be released in set 7 later? The Leo-pald build is not more expensive “because it is more versatile”. It is more expensive because most people believe Lox is crap (my personal opinion is withheld on that card), which is why Lox is only worth $3, which is pretty bad for a RRR. Look, I don’t like being overly critical, nor do I want to be harsh. But I saw multiple errors in this article, both factual and grammatical (such as run-on sentances), and I can tell this article was not proofread. There were plenty of sentances that gave no useful information (“His second skill is a persona blast, hopefully you remember what that is from my last article, and this persona blast” being an example; everyone who takes the time to read these articles should be experienced enough to know what a persona blast is). To be brutally honest, I learned nothing whatsoever from this article and it was a waste of my time. I appreciate that you took the time to write this article, but please work on the quality a bit more before you submit something for a large number of people to read. One thing I’ve learned about Vanguard is that despite its deceptive simplicity, there’s a lot of angles to look at any particular card or deck, and different people can come up with helpful thoughts and ideas about them. You can definitely make a helpful contribution to the online Vanguard community; it just needs a bit more work than what was put into this article. sorry I didn’t get to finish the article and throughly explain some more of the stuff I mentioned. Sorry guys, didn’t get to finish my article. stay tuned for part 2.